Starring Slugger: Rewind-2 Days to D-Day "Rooming In"
There's one word I think that perfectly described my attitude towards Casey's NICU discharge. From the get-go, Scott and I discussed that as much as we wanted Casey to come home, we didn't want her to come home until she was more than ready. I joked with the nurses that we wanted Casey to stay until she was old enough to sit up in her plastic crib. We all had a good laugh but I was kind of serious Yes, it gets a little old to spend half your waking hours in the same white chair wearing a hospital gown holding your child, but we could have done it if it meant keeping Casey someplace safe. The NICU is used to dealing with anxious parents and actually have something called "rooming in." From the minute it was mentioned, we were thrilled at the idea. You stay in the hospital overnight and you are able to practice taking care of your baby but with the expertise of the NICU staff at your side. 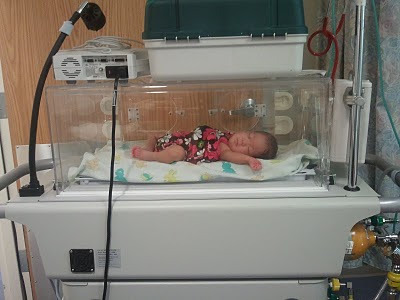 It gives you a chance to practice all the cares your preemie baby will need at home before you actually take them home. This was an awesome option for us. One, I was looking forward to being able to relax and just hold Casey as long as I wanted to without worrying about having to get home. Two, I'm a weirdo, but I was looking forward to staying in a hospital room. It's as close to a vacation as we have had in a while, staying someplace else besides our house with cable tv and food a couple floors down. I'm weird, I know. 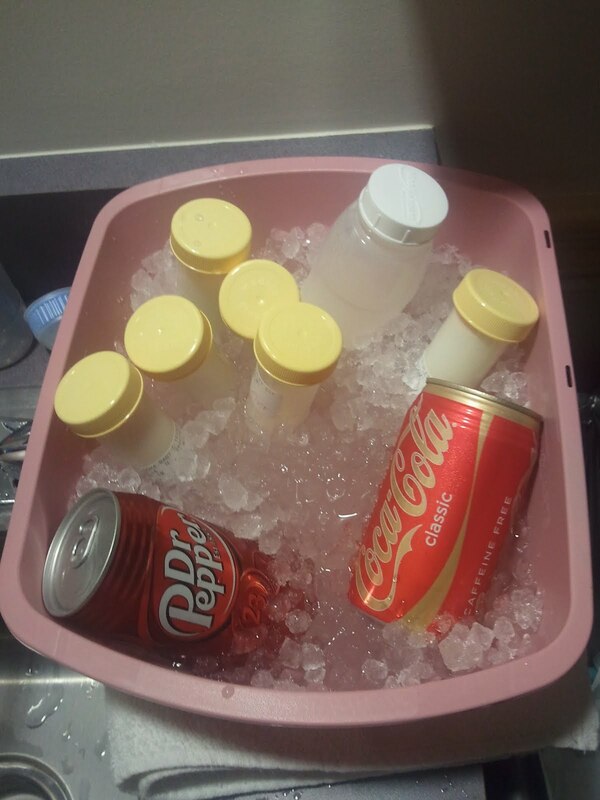 I was quite spoiled by staying in the hospital for the girls birth. Being doted on by the nurses, having a remote attached to your bed that controlled the bed, the tv, the lights. Scott was a little less excited, I got the great bed that you can adjust while he got to sleep in the "Daddy Chair Cot." Um, I didn't offer to switch. I might have had some misconceptions about this whole rooming-in thing. 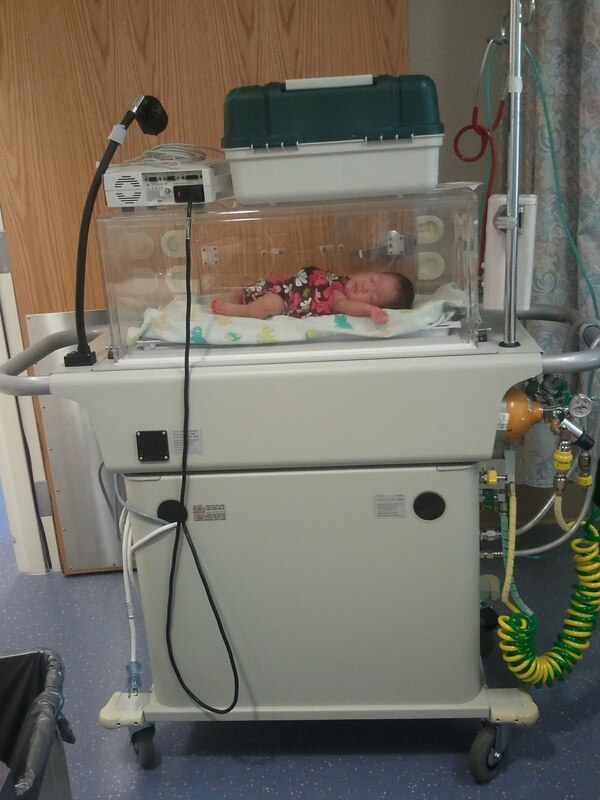 I thought that there were these special rooms with a bed/bathroom/sink/tv and then there was an attached room with a one-way window where a NICU nurse would be...on standby watching Casey's monitors in case she needed to fly into the room and rescue Casey. Or maybe the nurse just sat quietly in the corner of our dark room while Scott, Casey, and I slept...watching us as we slept. I was in for a rude awakening. When they explained it to us just a few days prior, they explained that Casey would have a NICU nurse assigned to her...but that nurse would be downstairs in the NICU while we would be upstairs in our private hospital room. She would come in periodically to check on Casey and come up immediately if we called or needed anything. But, otherwise, we would be alone with Casey to take care of her on our own. WHAT!!! Who do they think we are, her parents? The second and most frightening thing revolved around her monitors. Since her birth, Casey had probes and leads on her torso that measured her heart rate, respiratory rate, and blood oxygen. Two days before rooming in, I noticed that her monitor wasn't showing her blood oxygen anymore. Apparently, she didn't need it anymore. I got a little freaked by that. The nurses told me that we needed to stop relying on the monitors because we wouldn't have them at home. Little did they know that I was planning on unscrewing the monitors from the wall and taking them with us when they discharged Casey. The NICU staff also developed this super irritating method of blanking the monitor screen so that only they could see Casey's rates on their nurses station monitor but we couldn't see it. So mean. They say "Don't watch the monitors, watch your baby." I did try to develop the art of reading the nurses' face from across the room. I know...I know...we won't have the monitors at home. Even more reason to take advantage of them while she's still here in the hospital. It seemed logical. When I realized that there would be no actual nurse in our little hospital room, I did start to wonder how they were going to watch her monitors from two floors down. I had a dim hope they had some elaborate wireless system where they could have their monitors on the 4th floor read her probes on the floor. Nope, they told us, they just take everything off. Not a single wire. Not a single probe. It will be exactly like she's at home. Oh, crap. That's all I could think. We did rooming-in a little different. Usually, you room in one night and then in the morning, they discharge your baby and you leave one big happy family. Someone threw this other option at us. Room in one night, go home and rest up the next night...and then take your baby home. That sounded like a smart idea for us. So, we packed our bags and showed up at the NICU on Friday night although we weren't scheduled to take Casey home until Sunday morning. They let us choose whatever time we wanted to arrive but I kind of wish they just told us a specific time. I was so anxious to be there on time (5 pm) that I was on Scott's case and we rushed there without grabbing food. Well, we happened to hit there before Casey's meal time and then it was a shift changeover and then we gave Casey a bath. 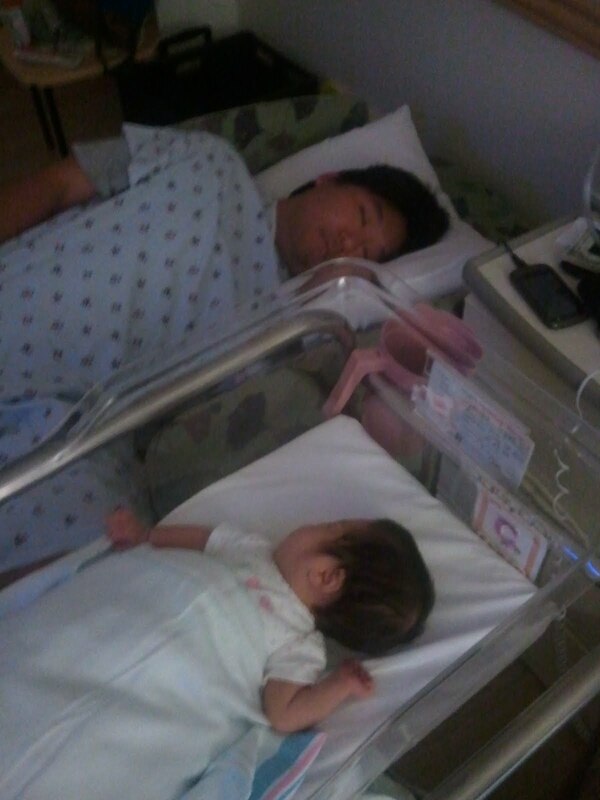 So we sat in the NICU about 4 hours before we finally headed up to our room. I tried not to look at Scott because I knew he was probably giving me stink eye as I wouldn't let him stop for food just to get to the hospital and end up waiting for so long. We got laughed at for the amount of stuff we brought for our one-night stay at the hospital. We were only there for about 16 hours, but I like to have lal the comforts of home. 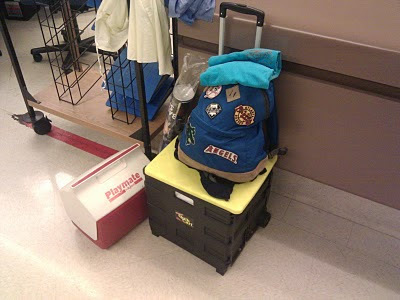 This pile below doesn't even show the backpack that I was carrying. Eva was our nurse for rooming-in night. First she had us practice putting Casey in her carseat. Casey got a bath. And then Eva took us up to our room. To transport babies in the hospital, they have to be in an incubator to keep them isolated from any germs in the rest of the hospital. It was such a huge moment. It was the first time in 81 days that Casey would leave the 4th floor of the hospital. Even if it was to go two floors up to the only other place she had ever been. 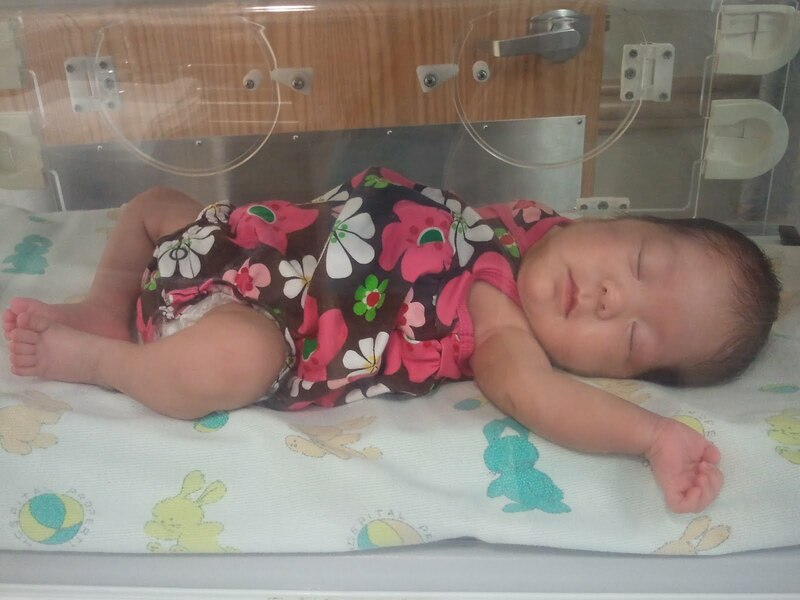 And she was in an incubator, the same type of incubator that had first brought her down from the delivery room. I wasn't awake but I can only imagine the tension around that first day, July 28th...the team of nurses, NPs, doctors, and respiratory therapists that escorted her down in that incubator that day in July. Her little 2 lb body frail and small, breathing with an oxygen mask. Now, she's this huge baby in comparision. Wearing newborn size clothing, breathing on her own. The incubator is heated so Casey sprawled out and took a nap. We watch a lot of TV. We kept wishing the NICU would install cable so one of the things I was looking forward to was being able to hold Casey and watch a night of TV with Scott. Of course, we're old farts now so by the time we got settled in and got something to eat...we were so tired already. 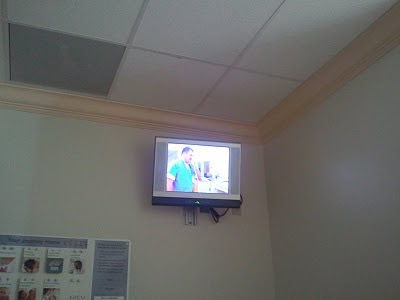 This picture below (I know it's hard to see) is one of the hospital channels and that's our friend on the screen, Dion. I remember flipping through the channels the last time I was in the hospital, the week of the girls' birth and seeing him all the time. He never told us he was a media star. We brought plenty of snacks and they gave us ice to keep milk cold. We looked like we were having our very own tail-gating party, beverages for the whole family in da coolah. I didn't get much sleep. I think I got about 1 hr 45 minutes of sleep the entire night. The best thing about Casey's crib is that it has plastic sides and it was perfectly the height of my bed. I literally was lying down and staring right at her face. We left the lights on and I just watched her chest to see the rise and fall. If I was ever unsure, I would lay my hand on her chest and feel her breathing. One things we learned about Casey that was hugely reassuring is that she makes so much noise while she sleeps. She grunts nonstop. And if you're grunting, that means you're breathing. Phew. Of course, it was even harder to get any rest with a noisemaker sleeping bedside. Scott got a little more sleep than I did. He's a great sleeper. Eva and Gina both came in at Casey's midnight feeding to check on Casey and they both laughed at Scott's sleepy expression. What can I say? He needs his beauty sleep. And yes, he wore his hospital gown the whole time...even though he didn't need to. He just loves hospital gowns...he loves how comfortable they are. I think I'm going to see if I can get some online for him. Ah, watching my family peacefully sleeping in the same room was one of the best moments ever. Casey eats every three hours and it takes about an hour an half to warm up her bottle, change her diaper, feed her, burp her, and just hold her. You would finish it all and realize, oh boy, she's set to eat in another 90 minutes. It was a tad exhausting. But getting to hold her, carry around without worrying about wires, spend time with her as parents without an audience of other babies and people...so priceless. By the time we left the next morning, I was anxious to take her home. And I knew that in less than 24 hours, we would be taking her home. 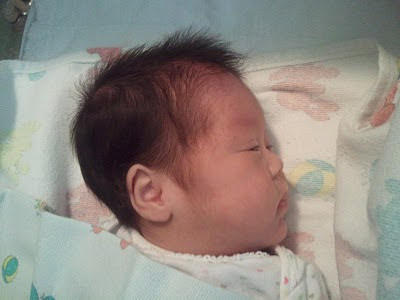 Hahaha, I've never seen her hair so poofy! It's usually all sweaty! Hey don't make like I was sleeping. You know I was totally posing for that picture. Yeah, posing. ... posing, gown and all? Hard to believe! Great write-up Keao!!! An incubator sounds like a nice place to take a nap... especially since it was below freezing last night, here in Rhode Island. Miss you guys. Casey looks so beautiful! It is hard to believe she was once so tiny. Although I have been seeing Scott's fb posts, just wanted to check on you and see how you are doing. Casey looks well, praise our God. Hope you are doing well, feeling His peace as you truly know His love.